London is about 10 hours away from Bengaluru by flight. But hey! That's too short a travel time! Why not drive ourselves by road, in our car? These might have been the thoughts of this dynamic couple who drove all the way, spanning about 20,000 kilometres, in their car. 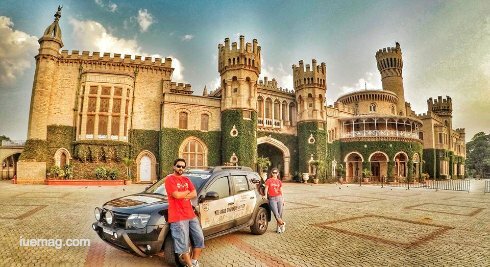 Fondly called "Bangalore Palace to Buckingham Palace", it was a journey of 55 days and across 18 countries. Meet Nishith Jois and Priyanka Nishith Jois. The former is an entrepreneur and the other, a Carnatic music artist and a Playback singer; but predominantly, big time long-drive enthusiasts. Nishith says that driving was always a part of him since he was about 8. From playing with plates as steering wheel, collecting ‘HotWheels’ cars and building toy garages for them, to driving long distances frequently, he has taken mammoth strides towards his passion. He also been a part of rallying in the INRC. Priyanka, on the other hand, who Nishith tells, took a liking for long drives only after being taken by him on many of them, has been an exceptional abutment to him. As I sit and converse with Nishith, I can’t help but notice how his eyes light up when he starts sharing his experiences. I do not just listen to him, but also long to live the journey. 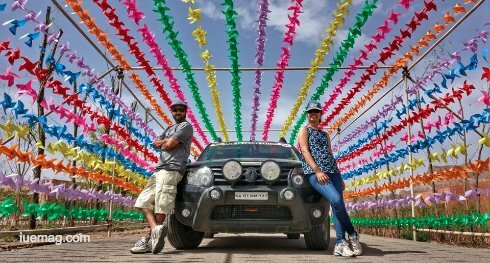 Nishith and Priyanka, prior to this one-of-its-kind sojourn, have made long trips to various places, including a marathon drive of 1600kms in less than 22 hours (Bangalore-Kanyakumari-Rameshwaram-Bangalore). “It so happened that when we came back home and I hit the bed, I close my eyes, and all I could see was cars”, Nishith says cheekily. Driving to London, they travelled through 18 countries- India, Myanmar, Thailand, Laos, China, Kyrgyzstan, Uzbekistan, Kazakhstan, Russia, Latvia, Lithuania, Poland, Czech Republic, Germany, the Netherlands, Belgium, France and finally the UK. They were joined by about 12 more cars in Imphal, from where they flagged off by the Deputy Chief Minister of Manipur. Nishith also recalls the day he was playing with his toy cars, and told his mom that one day he’d drive his car to a foreign locale. “I believe that if there is a dream, it must not be procrastinated. Who knows what lies ahead? Always strive to conquer them”, voices this man who also has a Limca Record along with his wife, for being the first Indians to have driven on the 2nd largest Glacier in Europe. “Generally, when people embark on drives, it’s for a cause. Many people also asked us the motive behind our journey. 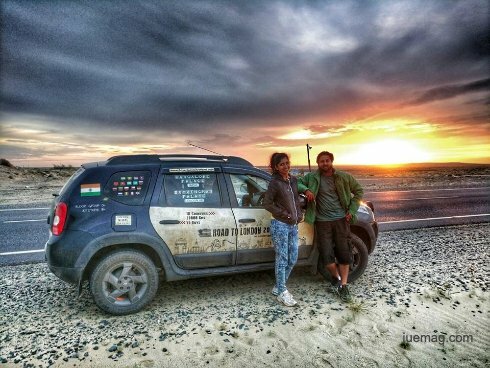 But we understand that- following our passion- is also a cause”, says Nishith who decked up his car for this adventure covering about half of the world map. There was also a message written on the car- “Truth Alone Triumphs”. Nishith, who also has played snooker at the state ranks and does modelling often, is a huge fan of speed. In the excursion, he got to drive through the world renowned Autobahn in Germany, the only road with no speed limits. Calling it the “Driver’s Paradise”, he said that driving on that stretch was indeed a surreal and an once-in-a-lifetime experience. At the same time, he also adds, “Speed is something that obviously gives an adrenaline rush. But it also must be understood that speed has its own places. It not only is in our hands to stay safe, but also with what the other person does. A small lapse in this equilibrium could prove fatal for anyone”. Starting the drive on 9th April, 2017, they reached London on the 2nd of June, 2017. They traversed across 8 time zones too. I ask him about the language barrier, and he shared an interesting story with me- “In Russia, not many people know the English language. The boards and names on the streets are written only in their native language. While roaming around for sightseeing, we looked at the language as drawings for us to remember things”. 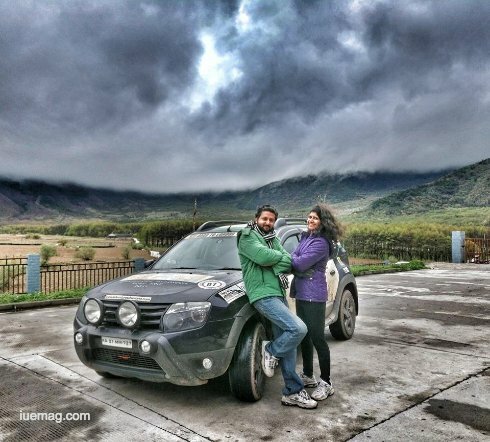 All along the expedition, Nishith and Priyanka experienced numerous moments of joy that’d remain etched in their minds forever- The warm hospitality of the Chinese to serve authentic vegetarian food for Priyanka; the kind gesture of a Belgian Chocolate maker who designed chocolate with words that announced their sojourn; the Russian cab driver, who was an ex-policeman, who took them on a tour of the city with great generosity; the interaction with delegates in Lithuania. Nishith also recalled an awe moment when a group of Kannadigas (the natives of the Karnataka state in India, where the couple hail from) came out on the Lithuanian highway and cheered for them. Knowing that this adventure carried huge amounts of uncertainty too, there was a lot of preparations required- not just physically, but also great mental endurance and car requirements- for the sole reason that 55 days behind the wheel is no child’s play. They started their preparation about 2-3 months prior to the due date. With just 4 hours of sleep every day on the journey, the sheer positivity and passion of this couple drove them towards their goal. Crossing various borders, the journey gave them an opportunity to indulge and learn about the different cultures. “Every border had something to offer them. Crossing India, into Myanmar, it was surreal as we were on foreign soil for the first time in the journey”. He also shared his experience at the Uzbekistan border where they were stranded for about 8 hours, due to the intense border security check- “Although it was a hassle then, it can be remembered with a smile now. It’s something not just anyone would experience often”. It was also important for them to explore the places and not just touch-and-go. Driving on the left hand and right hand sides in different countries was also an interesting experience. Driving for about 500-600 kms every day, there was a day when they had breakfast in Czech Republic, lunch at Germany, evening tea at the Netherlands and dinner at Belgium. After reaching France, they had to ferry the car through the English Channel. “Our first view of the Big Ben was blur” Nishith says; I have a question mark in my head; a wide smile appears on both our faces as he says another line- “Blur, due to the tears in our eyes”. Having got up on the morning of 9th April, they had dreamt of that day. Their joy knew no bounds as they saw the iconic clock tower appear in front. They then concluded their dream voyage on four wheels at the Buckingham Palace. 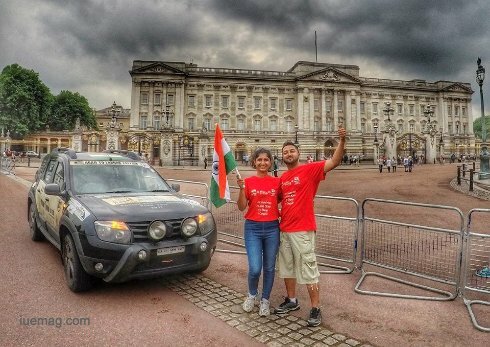 This story of Nishith and Priyanka not only is one for the travel enthusiasts to read but also for all people who have dreams. They go on to prove that, “armed with positivity and belief, there is nothing one can not do”. As it is written on their car- “Blood Group O+ve; Attitude B+ve”; believe and hope for the best, success and prosperity will trail behind you.